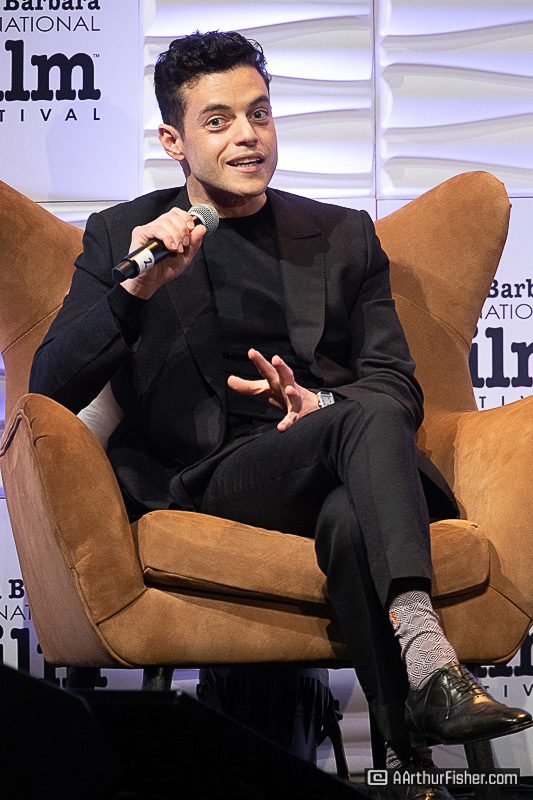 Rami Malek is shining in the limelight for his recent portrayal of Queen frontman Freddie Mercury in the box-office smash Bohemian Rhapsody, earning himself a Best Actor Oscar nomination this year. 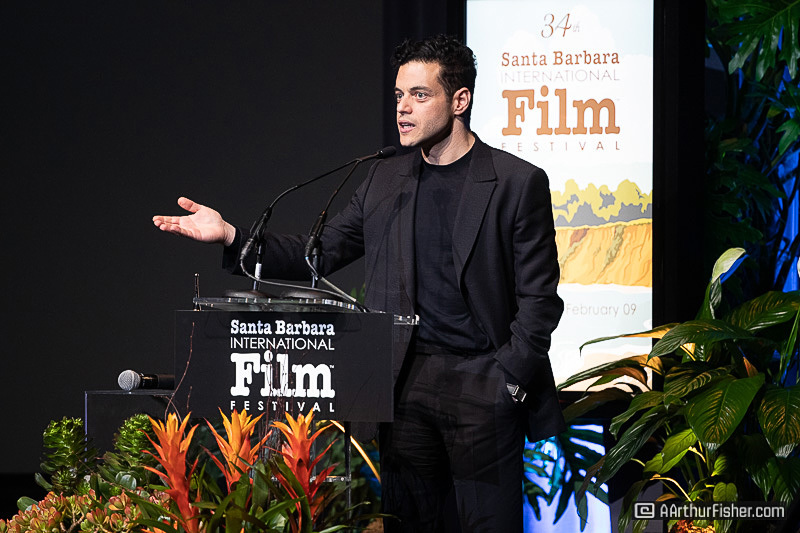 The 34th Annual Santa Barbara International Film Festival honored Malek with the Outstanding Performer of the Year Award in a tribute ceremony February 1st. 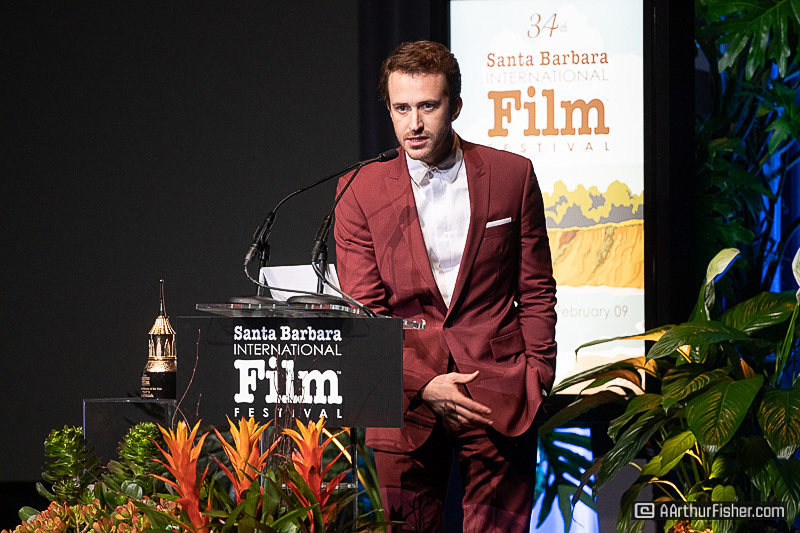 The award is given to honor the actor or actress whose role in a film has “exceeded greatness,” with prior recipients that include Allison Jenney & Margot Robbie (I, Tonya), Ryan Gosling & Emma Stone (La La Land), Viola Davis (The Help), James Franco (127 Hours), and Angelina Jolie (A Mighty Heart) to list just a few. 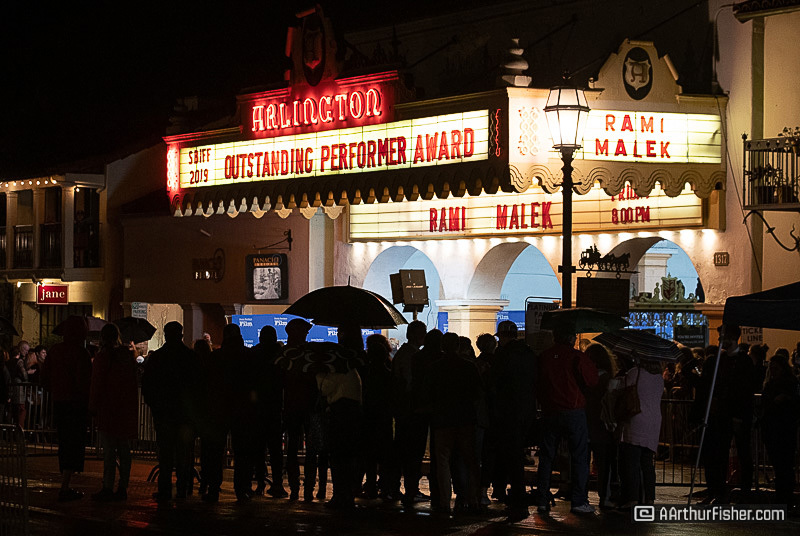 The Arlington Theater hosted the tribute, where thousands of fans, mostly very young and female, arrived in droves to catch a glimpse Malek. 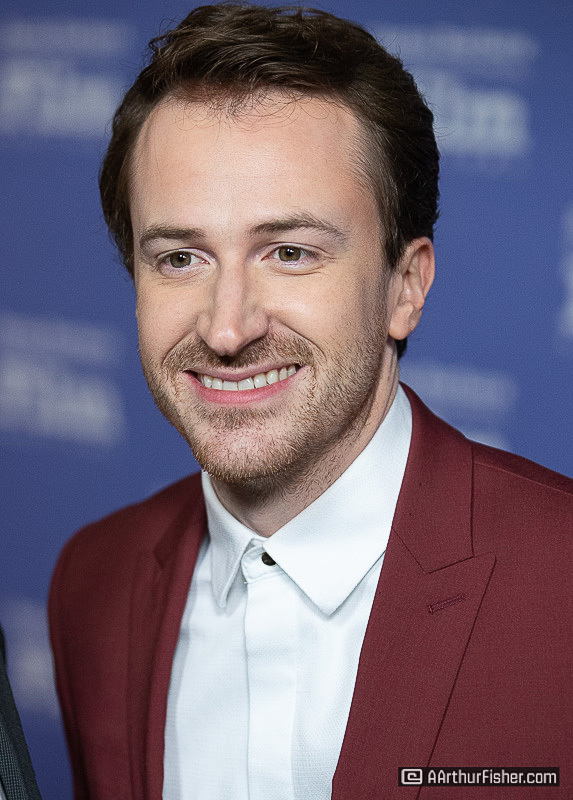 Malek graciously walked the red carpet, taking the time to stop and take selfies with his excited fans until eventually making it into the theater. 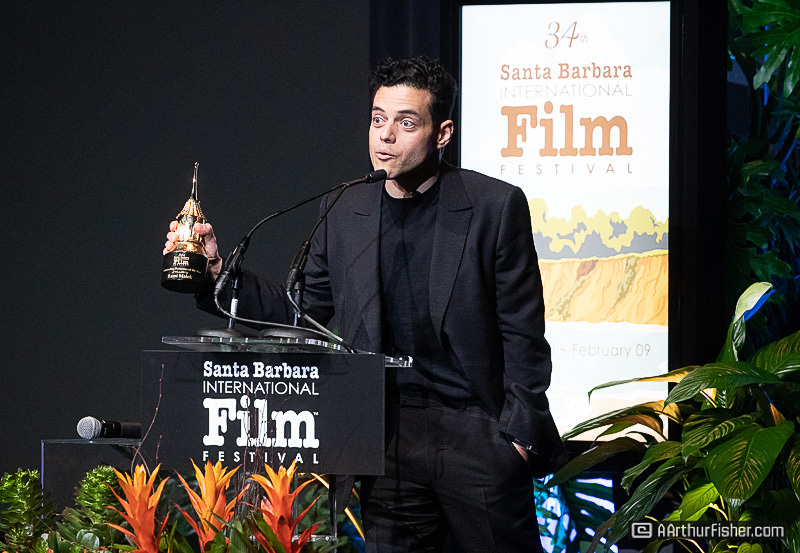 SBIFF Executive Director Roger Durling began the ceremony praising Malek’s performance in Bohemian Rhapsody as “incredible,” not just outstanding. 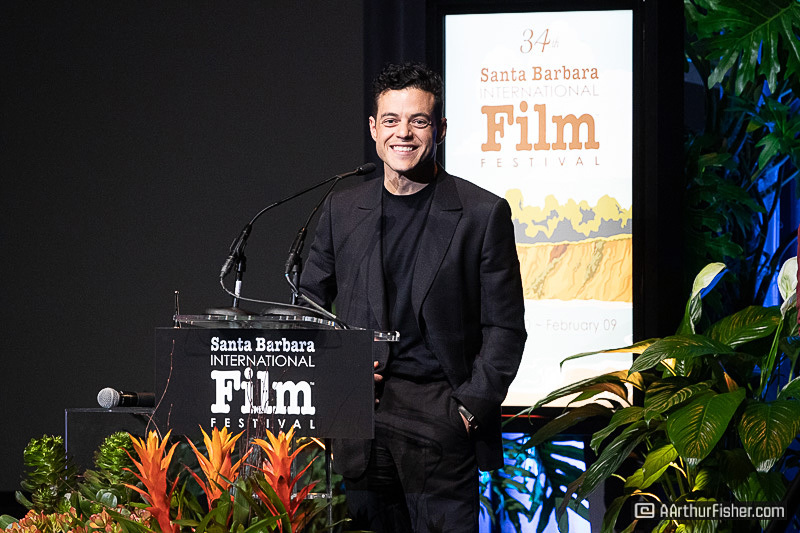 Scott Feinberg, columnist for the Hollywood Reporter and longtime SBIFF veteran, then took stage to moderated the evening and introduce a montage of Malek in the film. 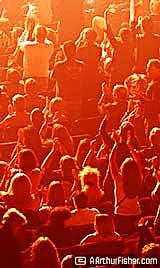 As the montage ended, Malek appeared on stage receiving rock star treatment with a standing ovation and screaming crowd. “I don’t think I have ever seen a reaction like that” claimed Feinberg as Malek made his way to his seat. 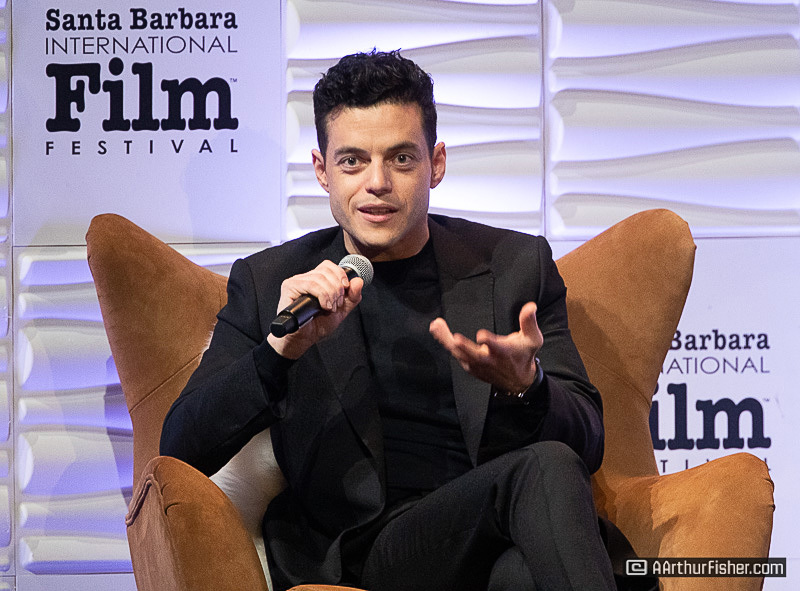 Feinberg delved right in, talking about Malek’s upbringing as a son of Egyptian immigrants living in Sherman Oaks, California. 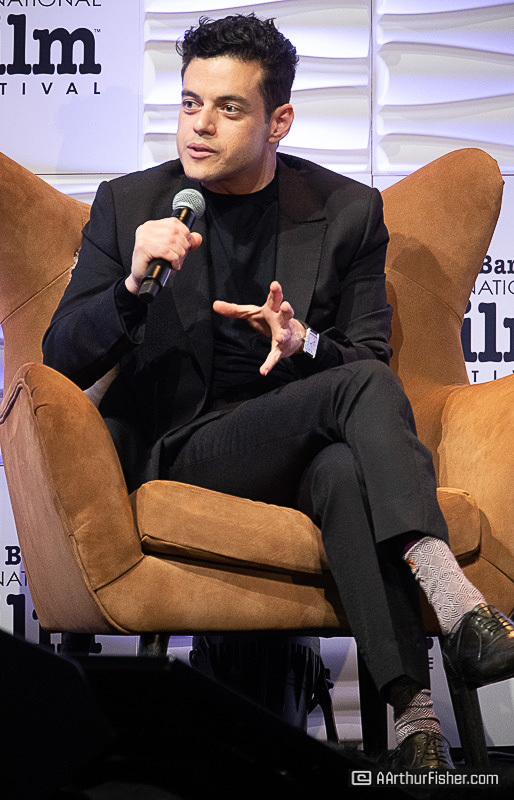 Malek began acting, or as he called it “dramatic interpretation,” after failing his attempt with the debate club at the age of 12. 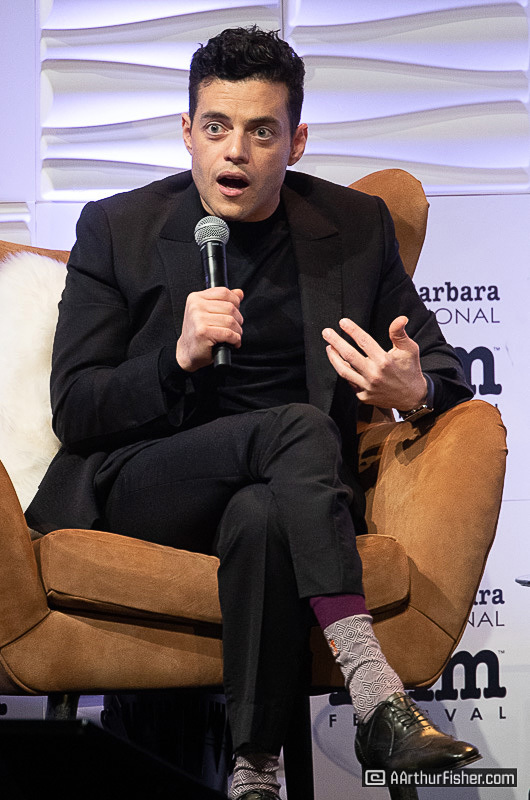 He recalled the moment acting clicked for him; it was during an early performance when he looked out into the crowd and saw that his dad was getting emotional. Malek claimed he had to keep it together – it was going to be a good moment. “I think we figured something out,” Malek explains of his experience. This theme continues throughout his career. Malek had his sight on acting schools in Chicago, but reluctantly and lovingly decided on Southern Indiana where he was able to explore more theater. He then moved to New York until casting director Mali Finn encouraged him to come back to LA. 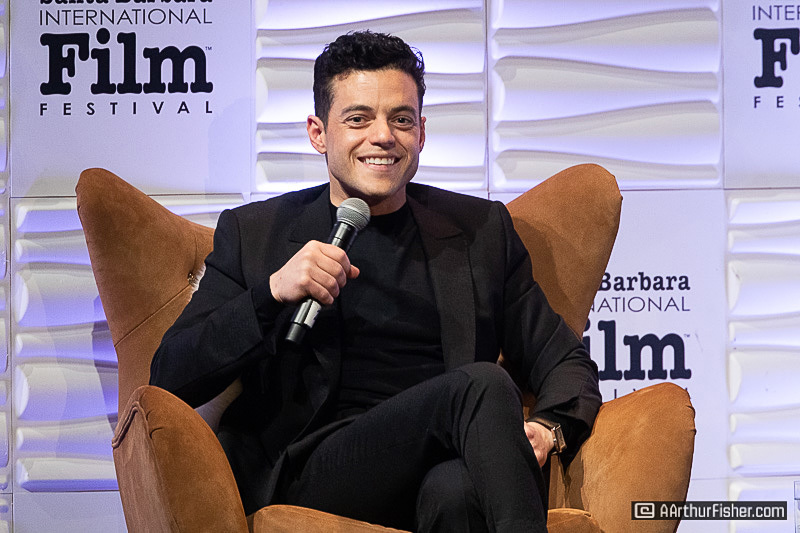 Malek contributes much, if not all, of his success, to the casting directors and teams that have supported and encouraged him over the years. 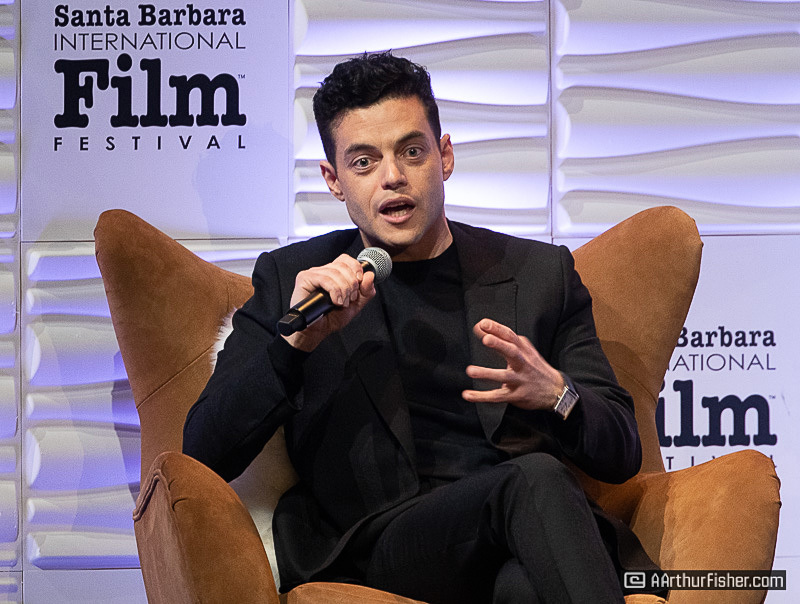 After a year of stuffing manila envelopes with his head shots and littering them around Hollywood, Malek finally received a call from casting director Mara Casey. 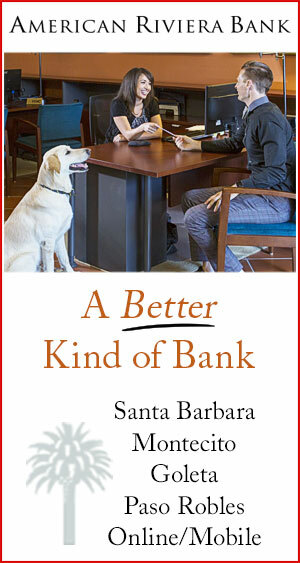 “She asked to speak with my agent, and I said “this is he,” Malek confessed. “She then told me to first get an agent, second join SAG, then give me a call back.” But Malek couldn’t let the moment pass, “I told her why can’t we do all that today?” Casey agreed, and by the end of the meeting she had cast him in his first role in the TV sitcom, Gilmore Girls. That same day he received a call from a person wanting to be his agent. “The world can change in a matter of hours,” Malek said. Then Feinberg moved onto the main event – Bohemian Rhapsody. “I said yes without hesitation. Then thought – what have you done? !” admitted Malek. The prep work was intense and included working with a movement coach. But the expectations were heavy, with the first day on set being the famous Queen set at Live Aid. 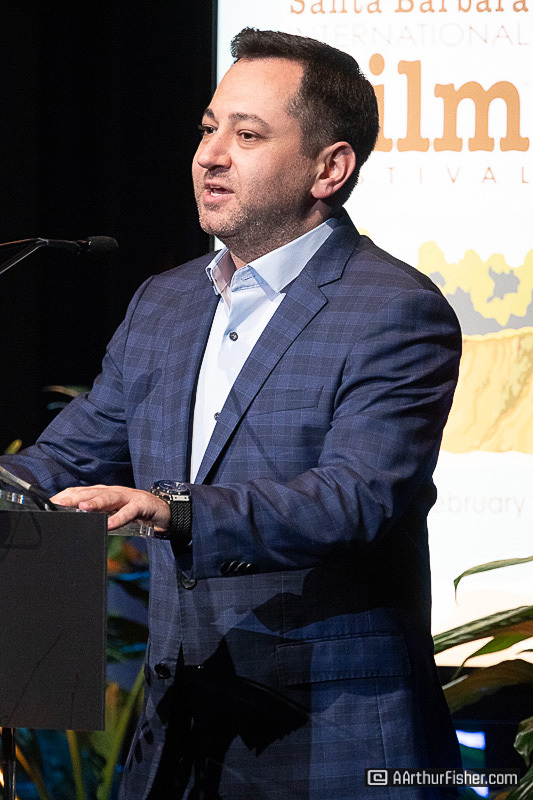 “I had to tell myself, collectively there are so many people here that want you to succeed,” which Malek said made the situation much less daunting. 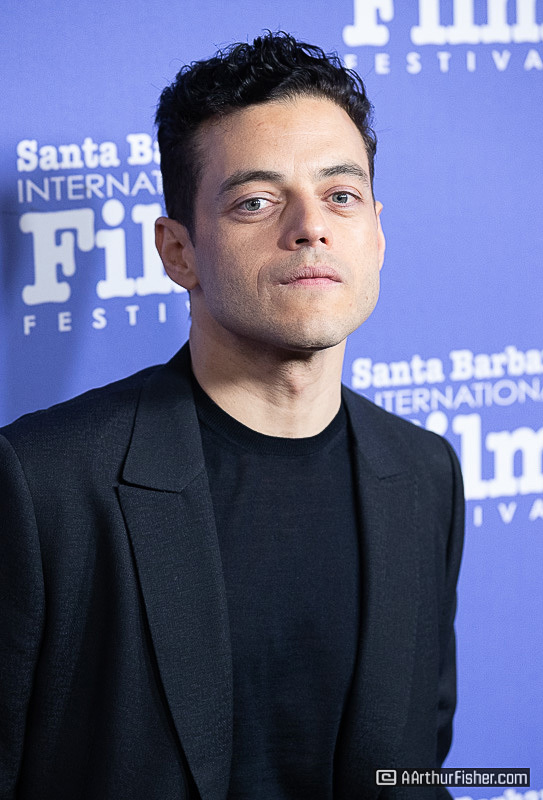 The award was presented by Bohemian Rhapsody co-star Joe Mazella, respectfully claiming “No matter how turbulent things got on the set with distractions, I never worried because I knew that as long as we had Rami Malek, we were going to make it great.” Malek was honored and humbled as accepted the award. 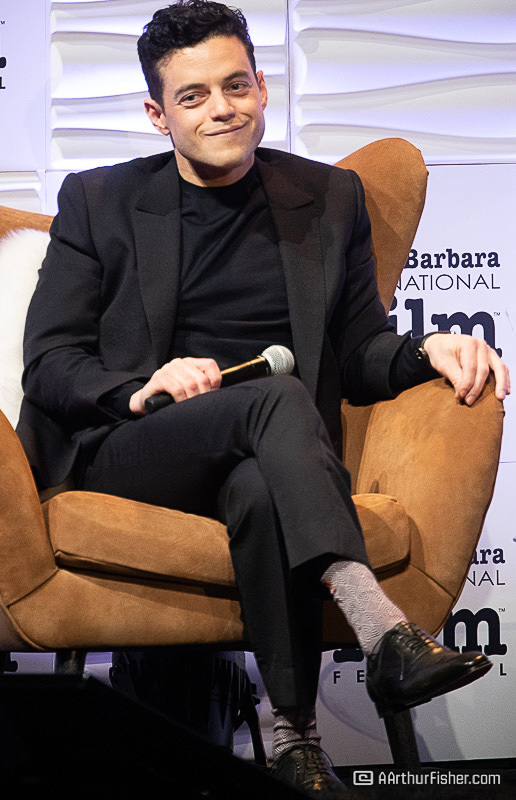 He lovingly addressed his fans in attendance, then jokingly thanked Feinberg for being so thorough in his questions. This was definitely another good moment.